First Lines: People around here say my father killed my mum. The weight of a secret can drag you under . . .
Sixteen-year-old Lucy Hart has been counting the days till she can get the hell out of Digger's Landing - a small Queensland fishing hamlet home to fifteen families, a posse of mongrel dogs, and Parkers Corner Store (no apostrophe and nowhere near a corner). But just like the tides, Lucy's luck is on the turn, and as graduation nears her escape plans begin to falter; her best friend, Polly, is dropping out of school to help pay the bills, and Tom has been shipped off to boarding school, away from the flotsam of this place. And then there's Lucy's nightlife, which is filled with dreams that just don't seem to belong to her at all . . . When the fish stop biting, like they did when her mum was still around, Lucy realises she isn't the only one with a secret. Its been a while since I've reviewed anything for a while so I may be a bit rusty. Hachette has sent me quite a few books the second half of this year, but because I've been in a reading funk, this is the first one I've actually read. 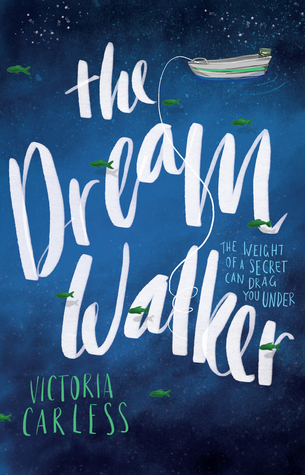 The Dream Walker is distinctly Australian. From it's terminology, to it's characters, it's setting and atmosphere. I do love reading anything from Aussie Authors because it paints Australia in a light I may not have seen before. This book for me was really hard to get into though. I'm not quite sure I can exactly point my finger on what but I think it was Lucy to be honest. She didn't grab me in a way other characters do. It wasn't until about halfway through that I felt the pull to her as a character and it was only when issues in Diggers Landing were heating up more that I felt completely invested in what would happen to her. I think I felt more attached to her dog Glen and that could be why I pushed through. Lucy lives in a fishing town and from what I can work out, probably Northern Queensland with the appearance of Artie the Croc. When Lucy tells her story and describes the people around her, it's clear that the town is barely surviving on the small catch the river provides. Descriptions such as "His rotting front tooth pressed against the pane lika a rat's. ", are throughout the book and it subtly describes the town's struggles. That particular description is of an older boy, at the cusp of adulthood who feels that Lucy is behind all the bad luck in Diggers Landing. He's a constant threat in the back of her mind. The town bully/bad egg if you like. Overall, though I struggled to get into this book, I really did enjoy this from about halfway to the end. Give it a go.. and if you struggle to relate to Lucy try to persevere, I have found that it does grab you and take hold.